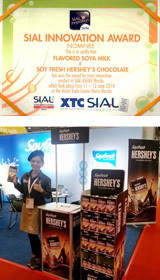 HERSHEY’S Soyfresh Chocolate Soya Milk won the SIAL INNOVATION AWARD 2014 at SIAL ASEAN Manila, Philippines which took place from 11-13 June 2014. Selected from a total of 204 exhibitors by a panel of jury from the SIAL Group and XTC World Innovation, HERSHEY’S Soyfresh was accorded the award based on its innovative characteristics and new consumer benefits. The SIAL Group is the world’s No.1 food exhibition organization. Through their 6 events on 5 continents, SIAL is the meeting place for almost 12,000 exhibitors from more than 100 countries reaching out to over 280,000 visitors. Through this network, SIAL offers a global platform to launch products and identify new market trends and opportunities.